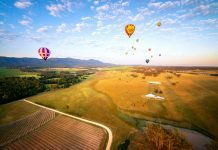 Wondering what things to eat in Sydney? Don’t worry cause we’re going to taco bout it. 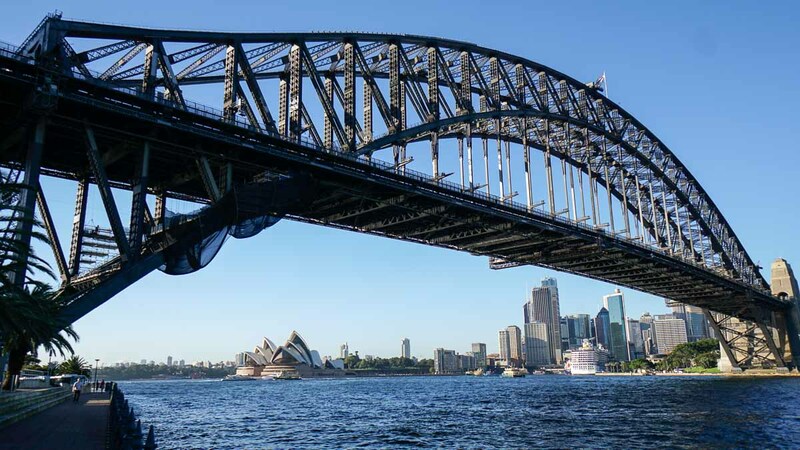 More than just a city of icons, Sydney is a foodie’s paradise. From unique fusion combinations to cafe food that both looks and tastes good, there is an endless supply of places to fill your tummy. 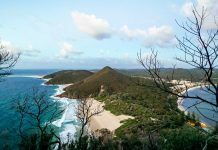 During our recent trip to the New South Wales, we spent a couple of days exploring the alternative side of Sydney and ate to our hearts content! To help you out, we combined some of our highlights with a couple of others we missed out due to the lack of room in our tummies. 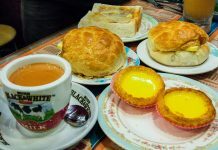 Plan your days around these affordable food trails, or mix and match as you wish to keep your tastebuds and bellies happy! *Pro-tip: Try to do this with friends so you’d be able to stomach more. Food also tastes best when shared! 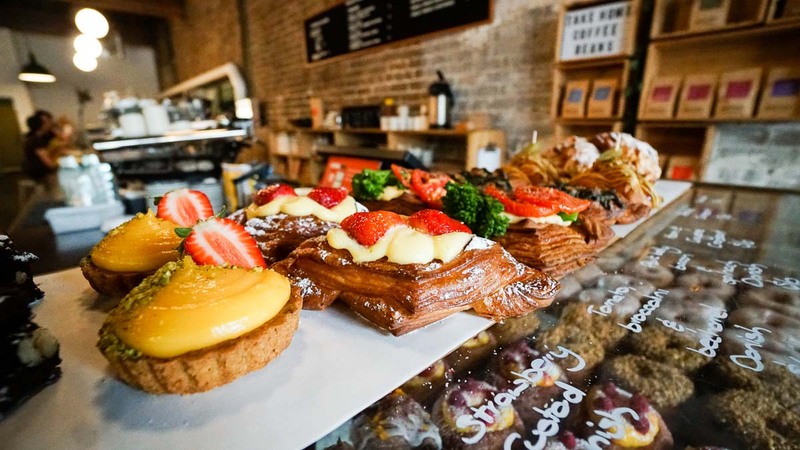 For those exploring the iconic sites closer to the harbour and around Central Sydney, this might be the perfect alternative food trail for things to eat in Sydney. 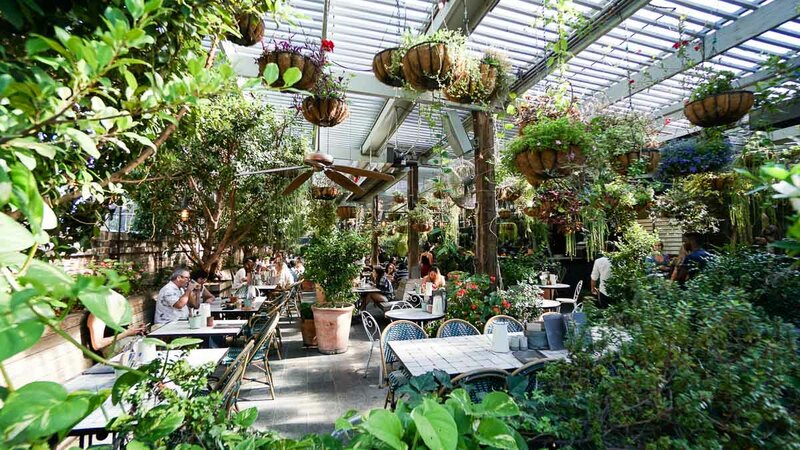 While this isn’t exactly Central Sydney, the Grounds of Alexandria is a must visit for anyone on a food trail of Sydney. Tucked in the middle of an industrial suburb, the Grounds of Alexandria is like the mother of all cafes. Other than looking extremely photogenic, there’s a network of small shops from artisan bakeries to fresh produce. But the highlight is the coffee. They roast their own coffee beans and even has a coffee research and education facility. *Pro-tip: Try either the Deconstructed Iced Coffee or their Coffee Tasting Board. If you have time, check out the nearby Mitchell Road Antique & Design Centre for some old school finds. 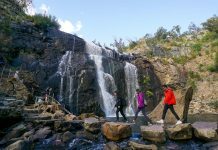 You might just uncover a hidden gem! 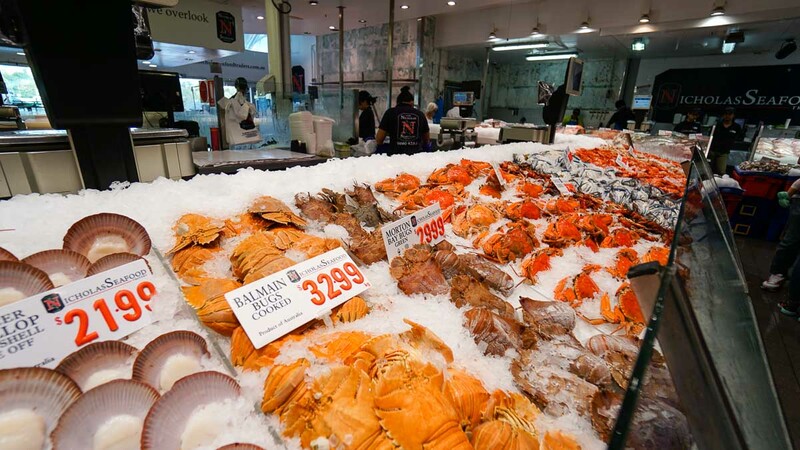 Seafood in Sydney doesn’t get any fresher than at Sydney Fish Market. Get here before the tour buses arrive for lunch and place your orders first. We picked a crab at Nicholas Seafood (down the hallway) and had them cook it for us! 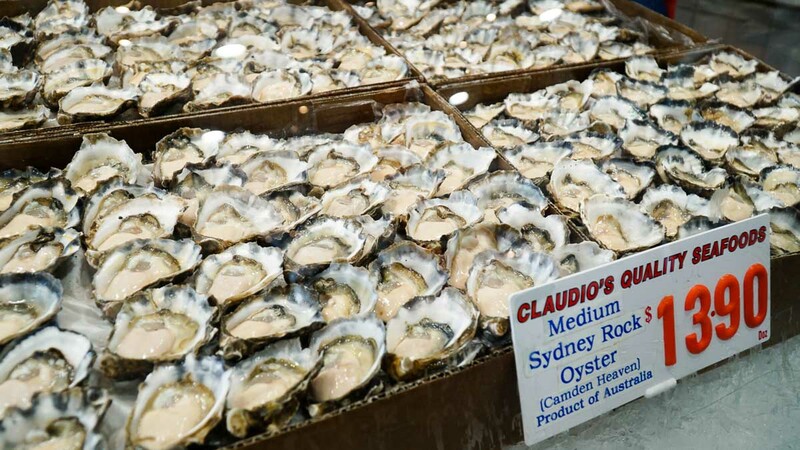 While waiting, we also grabbed a bunch of Sydney Rock Oysters as appetisers. 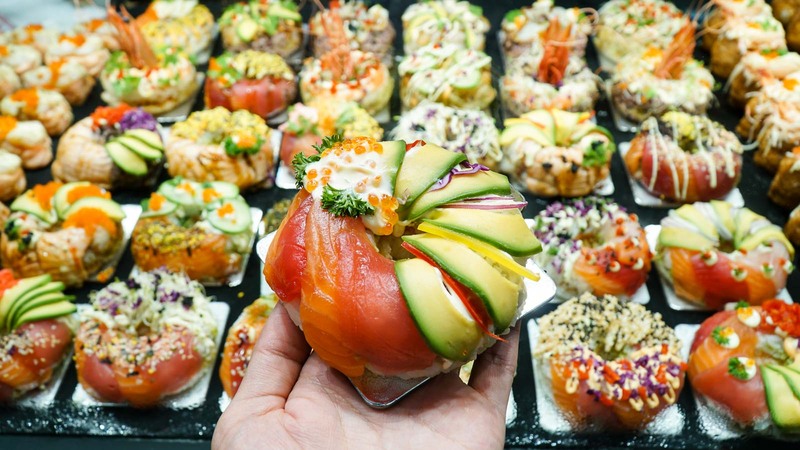 If you’re feeling adventurous, try the creative sushi donut at Fish Market Cafe near the entrance. 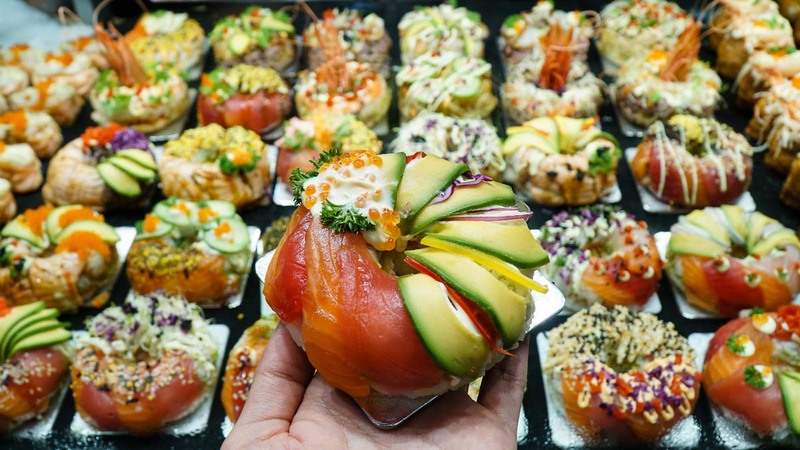 Don’t think that sushi is meant to be eaten this way, but it looks really good and tasted pretty interesting! 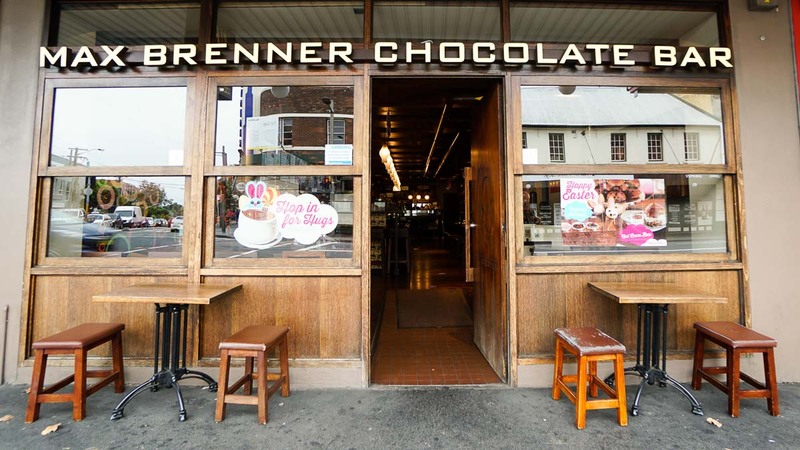 Take an afternoon snack at one of Sydney’s best pie shops. 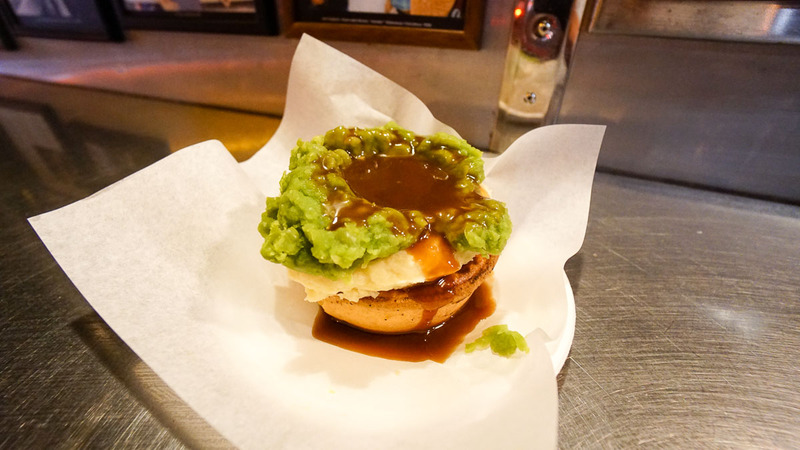 Harry’s Café de Wheels has been serving traditional meat pies with their signature mash and mushy peas since 1945 to customers on the road. 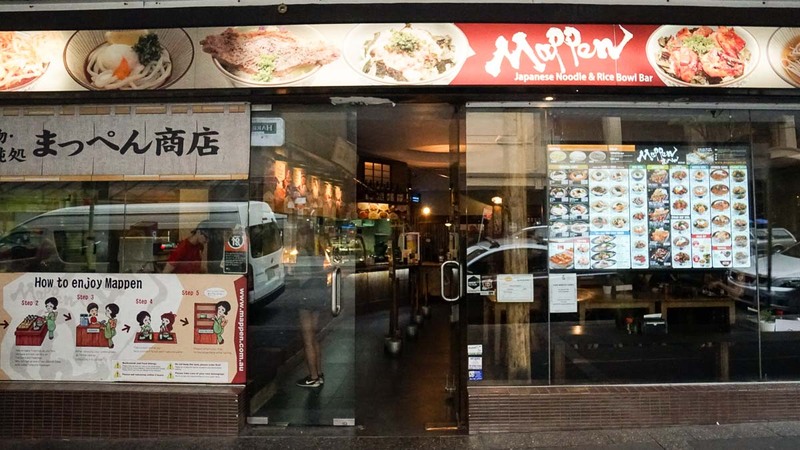 They have quite a few outlets now, but the one at Woolloomooloo is the original shop that has seen many celebrities like KFC’s Colonel Sanders! Here’s another one for the fusion food lovers. 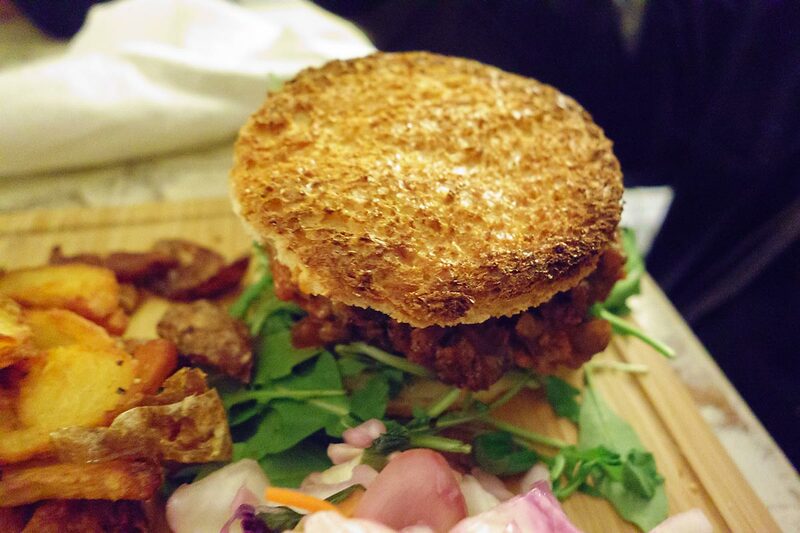 I’ve heard of rice burgers, but ramen burgers?! 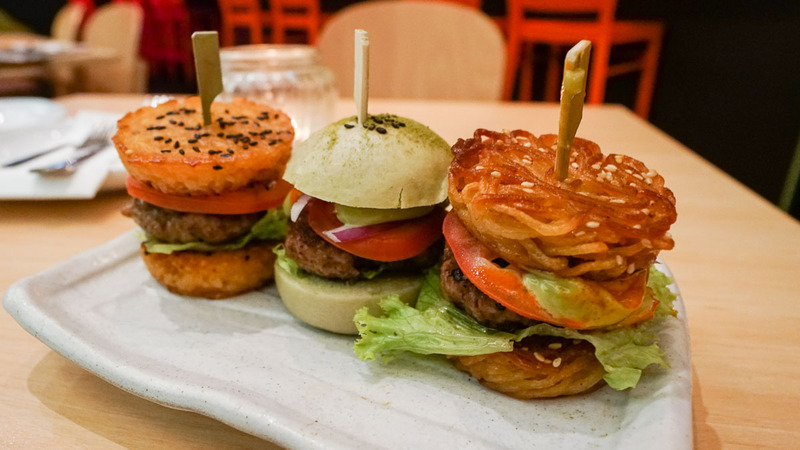 In our hunt for must try things to eat in Sydney, we found One Tea Lounge & Grill with their unconventional burgers. 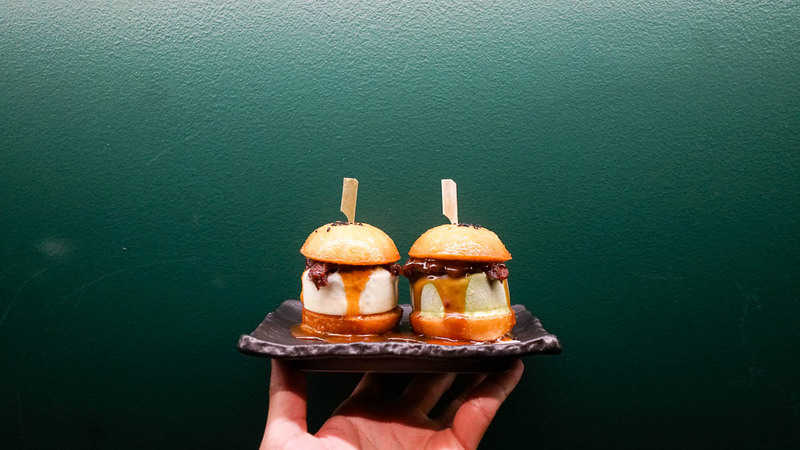 Their signature fusion sliders consists of 3 palm sized burgers wedged around a juicy wagyu beef patty and spicy sauce. The unique thing is that instead of using bread, they use crispy ramen, crunchy rice, and matcha baos. Do try their ice cream baogers too! Fried baos with miso caramel and either matcha, black sesame, lychee, or red bean ice cream. 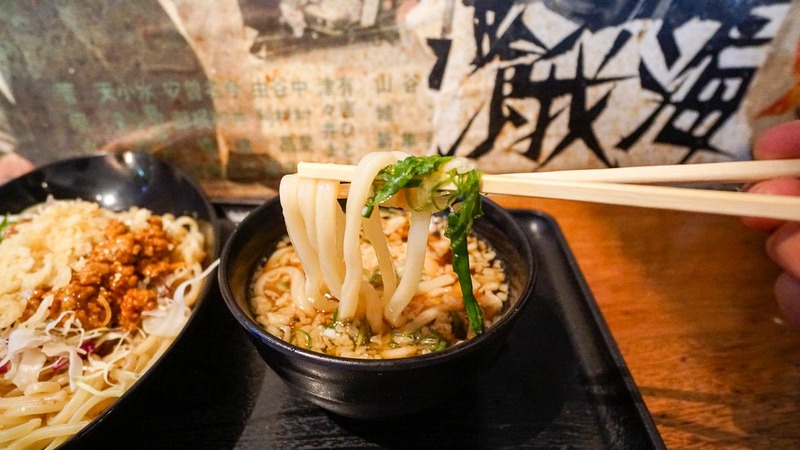 End the day at Mappen, a no-frills Japanese Noodle Bar. A friend had recommended this to us and we were all pleasantly surprised at how good the udon/ramen/soba was after a day of palette adventures. Cheap and good. 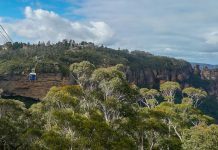 This cool suburb is one of the most interesting places to walk around in Sydney. 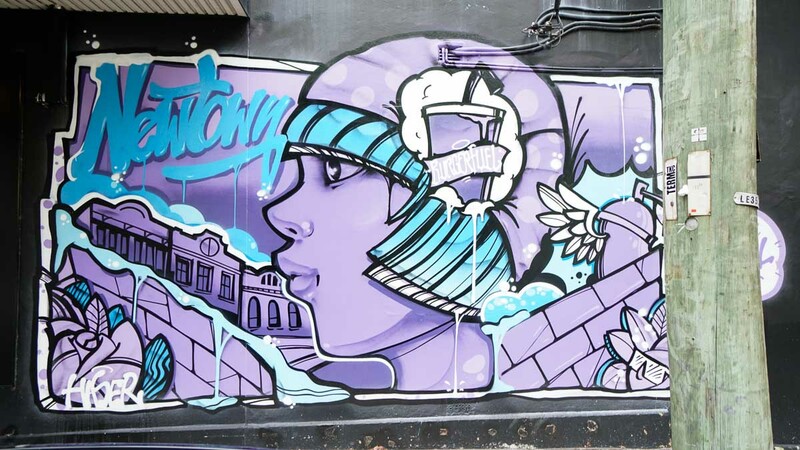 From cafes, bookshops, to boutique shops, it is said to be the heartland of Sydney’s colourful bohemian culture. Other than food, you’ll find street art, and chatty post war immigrants in the houses behind the main street. 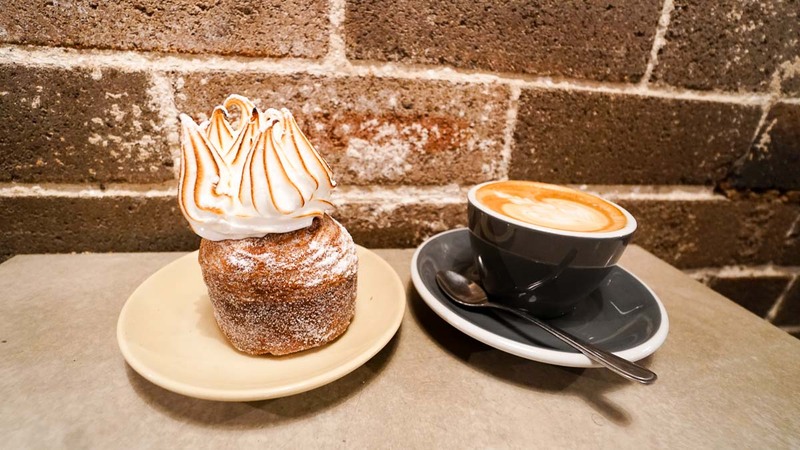 Start the day with brunch at Brewtown Newtown, known for their cronuts (croissant + donut) and cruffins (croissant + muffin). According to Cherie, this solves the morning dilemma of having to decide. If you love the flaky layers of croissants and the soft buttery flavours of a muffin/donut, this is definitely for you. 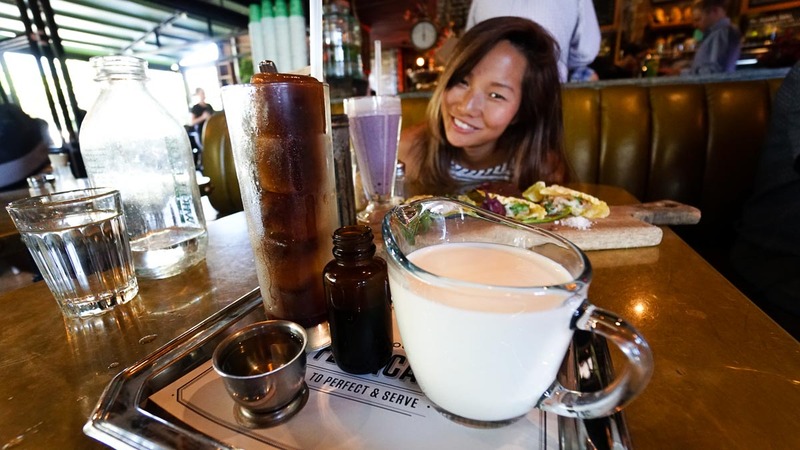 This pay as you want vegan and vegetarian restaurant in Newtown Sydney is the lunch fix you need before continuing with the food trail. Fill your tummies and souls with healthy and tasty food while contributing to their social cause of providing food without borders. 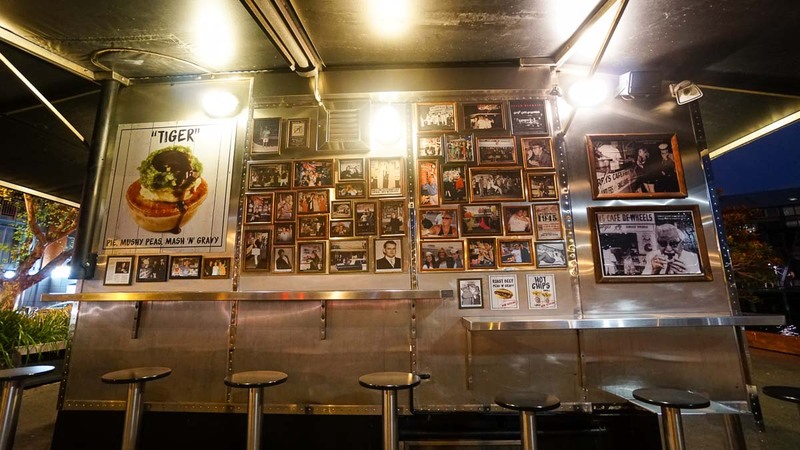 The menu changes daily so you will be in for a surprise! Cost: No set prices. Pay as you want, but we recommend at least AU$10. 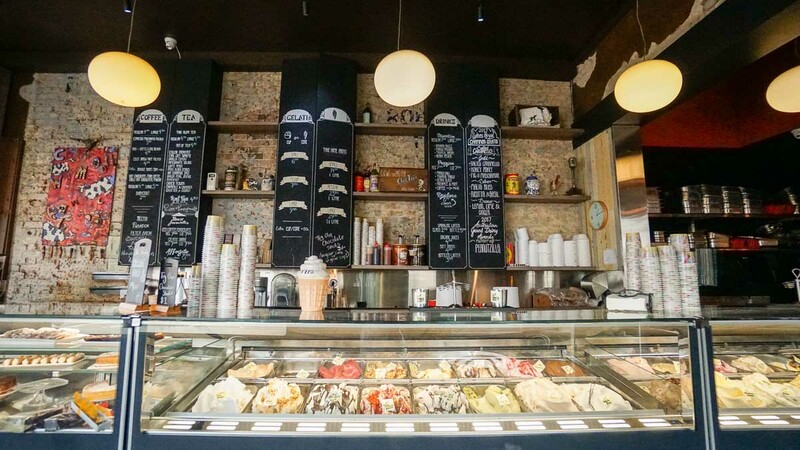 Finish off lunch with the world’s best gelato at Cow & The Moon. 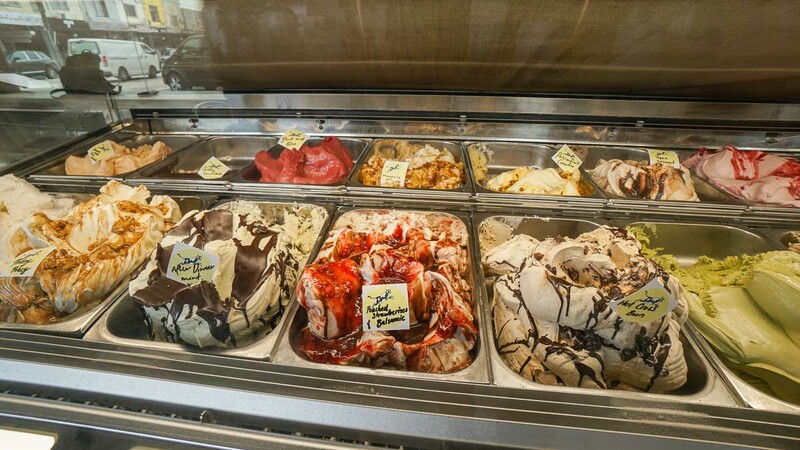 This award winning yet affordable gelato place boasts flavours like the Mandorla Affagato (voted best in the world) and Poached strawberries & balsamic (best in Australia). 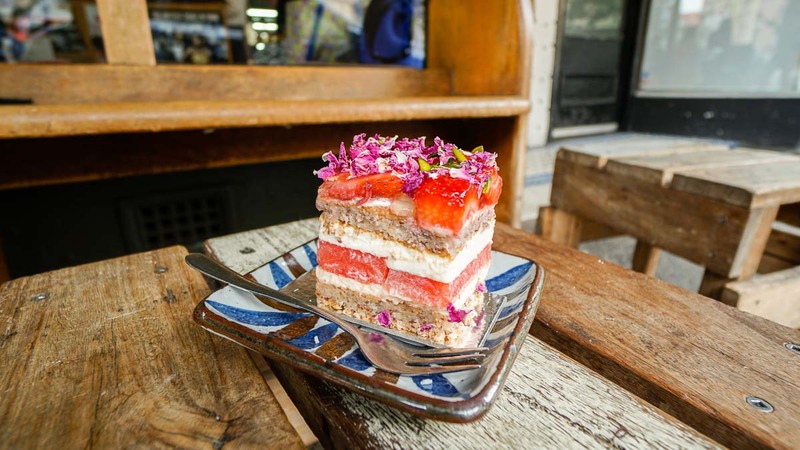 After more walking, check out the refreshing Strawberry Watermelon Cake from Black Star Pastry. It is really berry berry nice. We got ours in the afternoon, but we heard that on some days they get sold out before 11am. I’m not a big fan of cake (sorry! ), but still loved this as it was neither too sweet nor creamy. Especially loved the fruity and floral mix! *Pro-tip: If you’re afraid that it will get sold out, pop by early and reserve a slice before continuing with your food hunt around Newtown. Chocolate lovers rejoice! End the day at the decadent Max Brenner Chocolate Bar will help you experience chocolate differently. 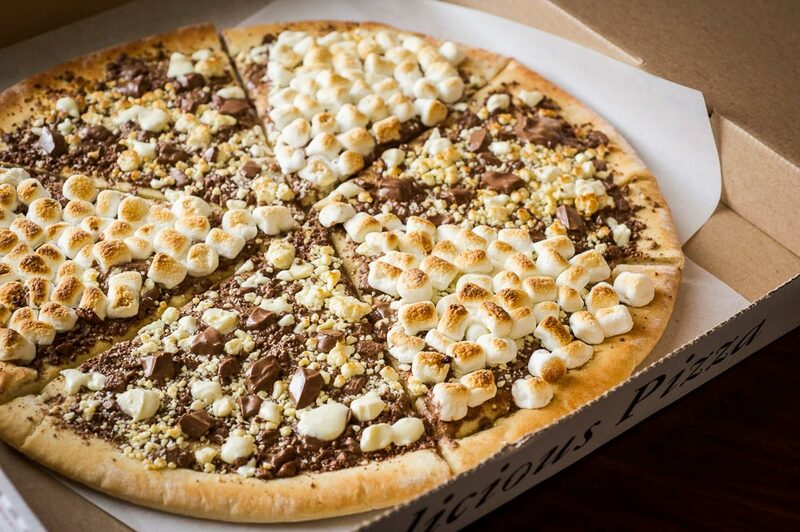 Be sure to try their signature Chocolate Pizza (yes you heard that right) — pure melted chocolate, caramelised pecans, cornflakes, marshmallows & white chocolate drops. Hope you found this handy guide to things to eat in Sydney useful. If you have a recommendation for other hidden food finds, do let us know in the comments below! Will be updating this in time. Like what you’re seeing? 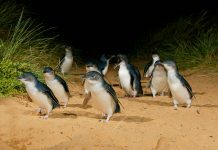 Do share and follow us on our adventures around the world on Facebook and Instagram.